Every once in a while, a TV show will land not just a good or a great piece of guest casting, but rather the absolute perfect actor or actress to take over a role. A few months back, it was announced that Paul “Pee-wee Herman” Reubens would play the father figure of Oswald Cobblepot on Gotham, and our rampant anticipation has been temporarily justified by our first look at Reubens in character. As shared on Twitter by executive producer Danny Cannon, everything about this shot is perfect, and Paul Reubens almost looks like he should be playing an older version of Penguin, rather than just the family patriarch. It’s not like Reubens and Robin Lord Taylor look exactly alike or anything – with noses turning in different directions – but they do share a certain something that suggests they come from the same family, and it’s not just the umbrella. Birds of a feather? It’s not like this is Reubens’ first shot at playing the elder Cobblepot, either. 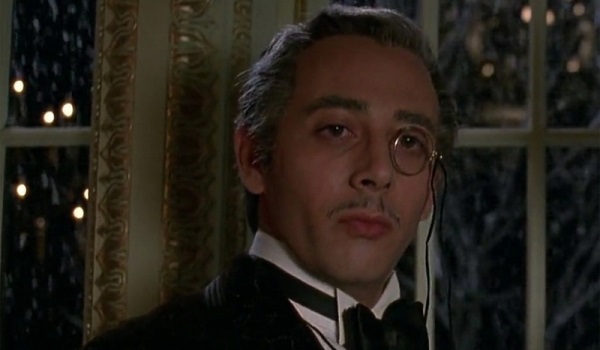 Back in 1992, he donned a monocle to play the role in Tim Burton’s Batman Returns. And while he looked great back then, as seen below, he has aged into the role excellently, and the updated look is much more suited to the grim underworld of Gotham than Burton’s stylized universe. I think Gotham’s producers should have reached out to Danny DeVito to come in and play Penguin’s brother or uncle or something, but we’re not really complaining. I can’t wait to see how Reubens and Taylor get along on screen. Penguin has been in a period of mourning ever since his mother died, and he’s formed a unique friendship with the Riddler. Will his Pops have some fatherly advice about finding better compadres, or will he be in full support of his son’s burgeoning criminal empire? Also, will we get to see him jump up on top of a table to dance in front of a bunch of bikers? It’s not clear when we’ll see Paul Reubens popping into Penguin’s life on Gotham, but we do know the comic drama will return to Fox for the rest of Season 2 on Monday, February 29. To see when the rest of your favorite shows are premiering and returning, check out our midseason schedule.